These models stand less than 3" out of your focuser and the 5x takes 1.25" threaded filters. They are parfocal in ALL 1.25" diagonals and prisms. For this reason, they are highly recommended over standard Barlows for 1.25" diagonals and refractors such as the Tele Vue-60. 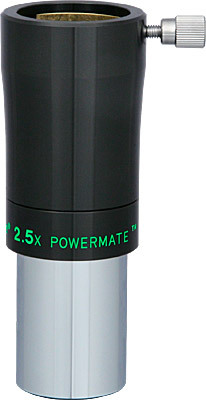 The 5x Powermate is ideal for long focus CCD and film photography, magnifying about 7.7x. It's an attractive, high performance alternative to eyepiece projection. The 5x is also perfect for slowing down your scope for Hydrogen-Alpha solar observing.